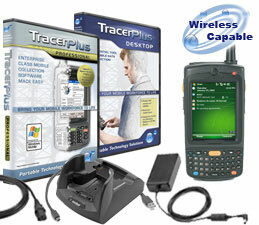 The MC7596 TracerPlus Pro Kit will bring a new level of efficiency to your mobile workforce overnight. Feature rich, the MC7596 includes 3G WAN, 802.11a/b/g, SiRF III GPS, and a choice of barcode scanning engines. These cutting edge features coupled with TracerPlus Pro software will allow your users to collect and share data with servers located around the world or just down the road. Barcodes can be scanned, and GPS coordinates recorded instantly, giving your organization the ability to improve customer service, decision making and quality.